← Huge Silent Translucent V-Shaped Object. STRANGE FORMATIONS OF LIGHTS FOUND IN BACKGROUND OF PHOTO. Description: A woman was waiting to watch her son practice soccer and snapped some photos. Later when reviewing the photos she found some strange formations of lights in the sky. She did not see anything unusual. She said that she took the photos outdoors and not through the windows of a vehicle. She took the photos with an I-phone X. She wanted to know if the lights were UFOs. Note: The lights could be reflections of ground lights off of the clouds, but that is speculation. The ground lights in the photo would not cause the reflection. The witness sent three photos and the large formation shows up in all three photos. Only the first photo shows two formations of lights. 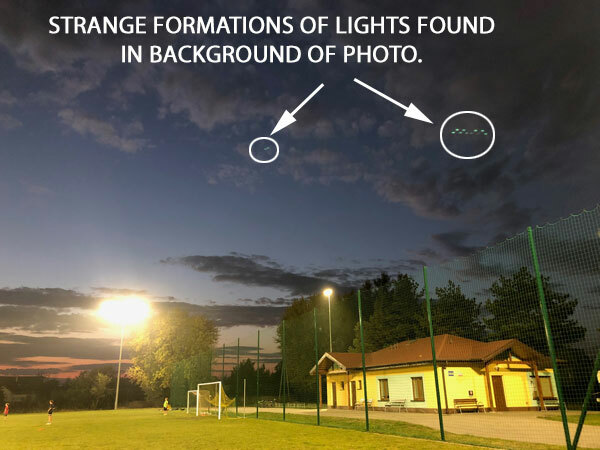 This entry was posted in Discovered anomaly in photo, Formation of Lights, Orb(s) of Light, Photos, Possible reflection, UFO Sightings 2018, UFO Sightings Poland. Bookmark the permalink. 3 Responses to Strange Formations Lights Found in Photos. Nighttime sports field lighting comes in many different configurations. Thanks for your comments. I am not so sure that it relates to the lights at the sport field? While I would like to see the photo without the circle and arrow around the object on the right hand side, it certainly looks like some sort of aerial object that is partially obscured by the cloud cover.